THE POWER OF PEAT WITH THE ELEGANCE, COMPLEXITY AND FLORAL TOPNOTES FOR WHICH OUR BRUICHLADICH STILLS ARE FAMOUS. COULD IT WORK? PORT CHARLOTTE SINGLE MALTS, PEATED TO A HEAVYWEIGHT 40PPM, REPRESENT OUR ONGOING EXPLORATION INTO THE PEAT FIRED LEGACY OF A GREAT DISTILLERY, NOW SILENT. Two miles south of Bruichladdich, hugging the shore of Loch Indaal, lies the village of Port Charlotte and ruins of Lochindaal Distillery, that ran spirit for 100 years between 1829 and 1929. Following his visit here in 1885 Alfred Barnard wrote: “Peat only is used in drying the malt, fired in open chauffeurs”, a testament supported in a few surviving faded photographs showing the huge peat stacks waiting to be fed to the kiln fires. Our heavily peated Port Charlotte single malts are a tribute to the men who once worked this great, now silent, distillery and the skills and legacy they passed on. Trickle distilled in our cathedral-like still house at Bruichladdich, the spirit is then matured in the original old stone warehouses in Port Charlotte. Living proof that peat can mean elegance. 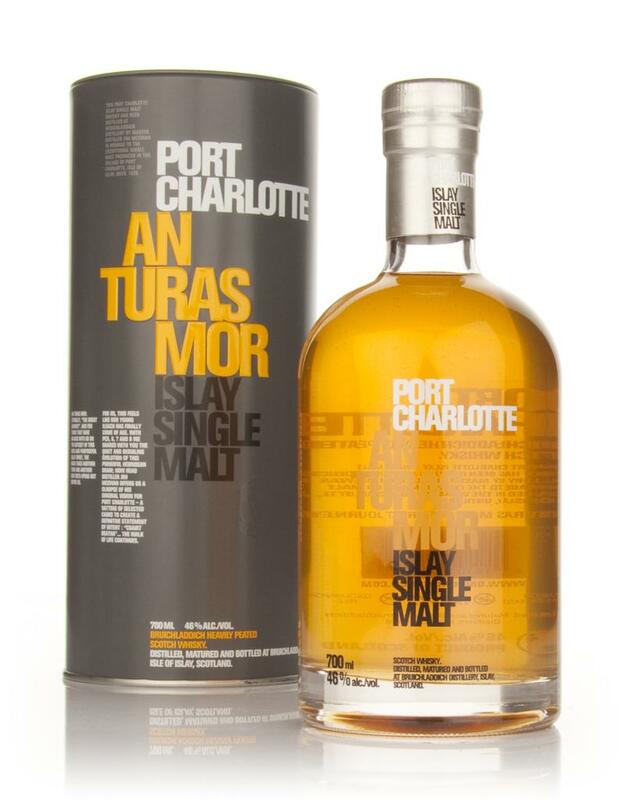 Port Charlotte Multi Vintage An Turas Mor – Gaelic for The Great Journey. A cleverly complex, peaty spirit with strong individuality of character, and absolute integrity. Peat smokiness with vanilla sweetness. Followed by spicy black pepper and lemon spiciness, then little wavelets of saltiness. Waiting patiently to emerge are nutmeg, cinnamon, wild mint and the malty sweetness of spring barley. Brilliant creaminess. The texture, layer upon layer, imparts an evenness of flavours across the palate and cools the peat fire warmth. A beautiful waltz of aromas, scents, flavours and feelings move across the palate. Total. An extraordinary mix of vanilla sweetness and peat smoke with a splash of green fruit syrup and it lingers long and mellow giving total satisfaction. A captivating and uplifting experience to enjoy the art of traditional handcrafted distillation. This is complete. Defiant. They shall not pass. The thin red line. Many thanks to Bruichladdich Distillery for review sample. Thanks also to Steve at Somerset Whisky Blog and Tom at Toms Whisky Reviews for sharing. Wow, a massively peaty nose but a real creamy vanilla palate on this little enigma. I enjoyed this one so much as the peat is so thick it throws out nutty, chocolate and bbq meaty flavours like crazy. The briny/seaside or seaweed character in this really reminded me of good Welsh Lava bread (or Laverbread) too, really baked in and integrated. Just delicious!